We did it! The conservation of the Thomson-Walker collection of medical portraits is finally complete! It took four years, five interns, dozens of batches of carboxymethylcellulose (CMC), several metres of lens tissue, and an indefinite number of acid-free paper sheets, but the 3,000 prints are finally free from acidic secondary supports, adhesive residues and tape hinges, and are now ready to be fully catalogued and digitized. At the beginning of my internship, I wasn’t sure I was going to be able to get through the final boxes in the collection. The previous interns’ fantastic work (you can read all about here, here, here and here) left me with 600 prints to conserve, from portraits classed under letter “P” to the ones under “Z”, with two jam-packed boxes labelled “S” in between. I really wanted to do my best to complete the project, since I was going to be the last intern to work on the Thomson-Walker collection, and also because I was determined to challenge myself, testing the workload I was able to carry out in a short period of time. Thomson-Walker Internship – Round 3! It has been almost eight weeks since I started my internship at the CRC and sadly, this is already my last week working here. After graduating in conservation at the University of Barcelona, I worked as an intern in other institutions and studios around Spain and now I feel extremely lucky to have had the opportunity to work on the Thomson-Walker collection, a large collection of 2700 prints. I am the third conservator to work on this project, which has definitely been an advantage as I was able to start my work on the very first day. I have to thank the two interns before me for that, Samantha Cawson and Victoria Haddock, as they have provided detailed reports to help the future interns on this project. This information has been essential for me to get into the rhythm and way of working in the studio. In the same way, I hope to provide other interns in the future with some new ideas. Given the size the collection, it is always beneficial to find new ways and methods to speed up the work and to get the most of these (very short!) weeks. 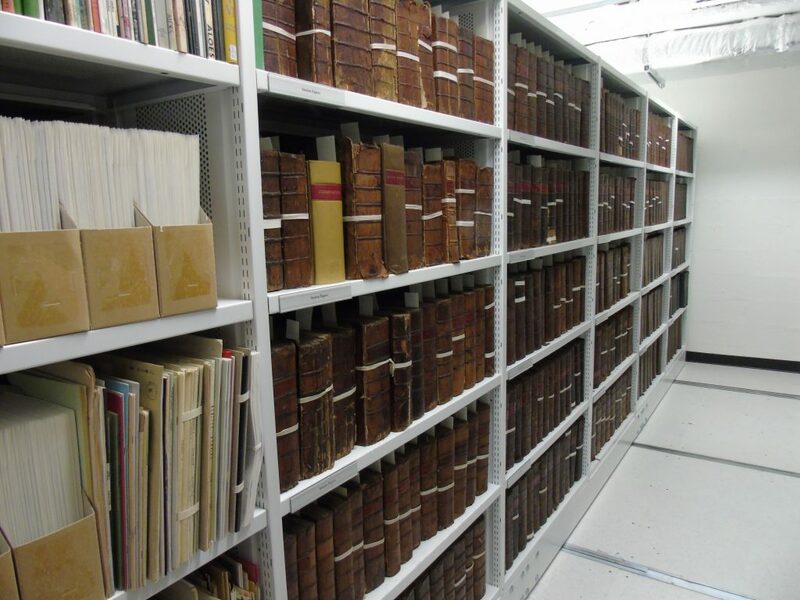 I have recently carried out a condition survey of three collections of Scottish session papers across three sites in Edinburgh; the Centre for Research Collections, Signet Library and Advocates Library. Session papers are documents used in the presentation of cases in the Court of Session, Scotland’s supreme civil court. They are the written pleadings of contested cases, plus non-legal documentary exhibits such as drawings, plans and maps. The papers give a valuable insight into the social, economic, political and legal history of Scotland. 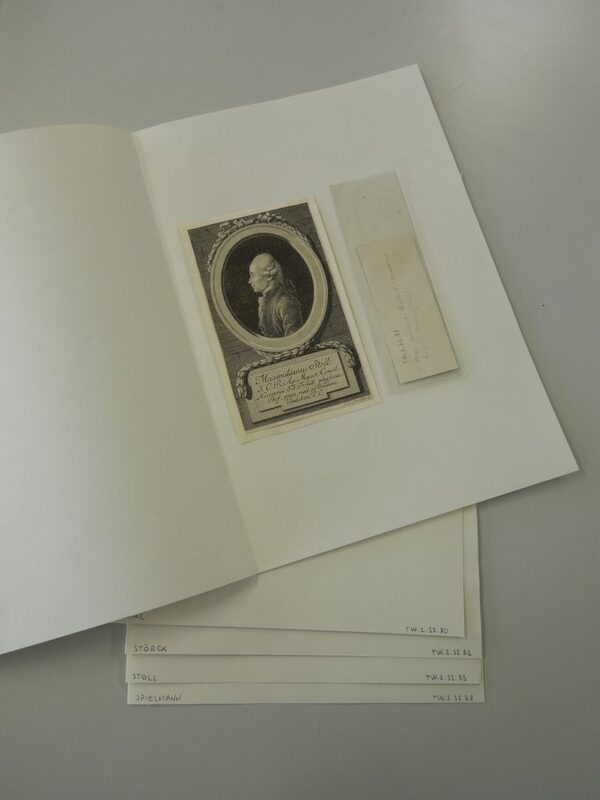 I am carrying out this survey as a part of a pilot project to evaluate digitisation options, and estimate the time needed to conserve and digitise the collections and the associated costs. This project is being carried out in conjunction with John Bryden, Project Photographer in the Digital Imaging Unit team. 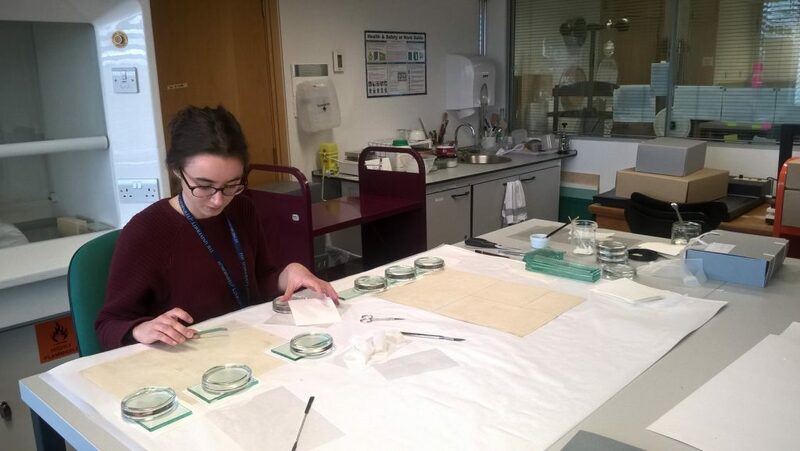 Over the past two weeks I have had the pleasure of working with the conservation team at the CRC as part of my summer placement for my Master’s degree in conservation on works of art on paper. Following an intense but fulfilling first year studying at Northumbria University, the summer has provided a very welcome respite from assignment writing and the opportunity to put some of my newly taught conservation skills into practice! Working alongside Emily Hick, the Special Collections Conservator, I have been fortunate enough to assist her in the completion of the final stages of the conservation treatment of a collection of 32 portraits from India, which Emily has recently written about in her Passage to India blogs (part 1 and part 2 can be read by clicking on the highlighted text). 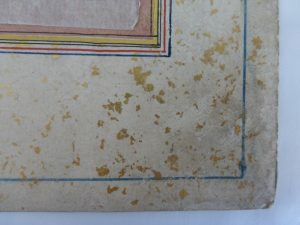 In this week’s blog, Special Collections Conservator, Emily Hick, describes the next stage of conserving a collection of Indian paintings, and explains how she used a rigid gel to remove old tissue papers that were adhered to the front. You can read part one of this blog here. After completing a condition report and putting together a treatment proposal, we began interventive treatment. The first step was to surface clean the paintings. This removes all loose surface dirt, which can be harmful to paper documents, and prevents the dirt from sinking further into the paper fibres during the later aqueous treatments, making it difficult to remove. To do this we used a soft goat hair brush on the painted areas and smoke sponge on the borders. We cut the smoke sponge into small pieces and used a dabbing motion to avoid removing any of the gold leaf sprinkled on the surface. A good quality Mars Staedler™ rubber was cut into thin slithers and used to remove areas of ingrained dirt on the edges of the painting. 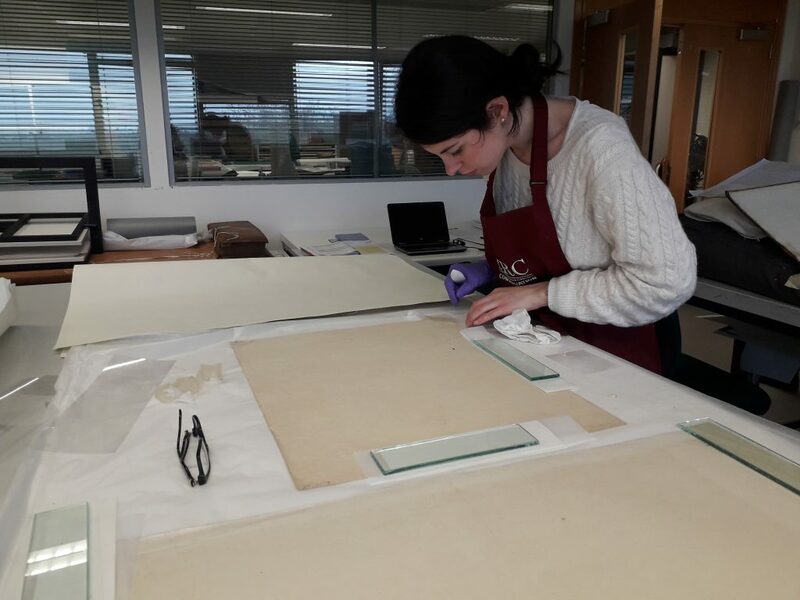 This week’s blog post comes from Conservation Volunteers Mathilde Renauld and Paula Burbicka, who recently attended a paper conservators new and ideas exchange event at the CRC…. 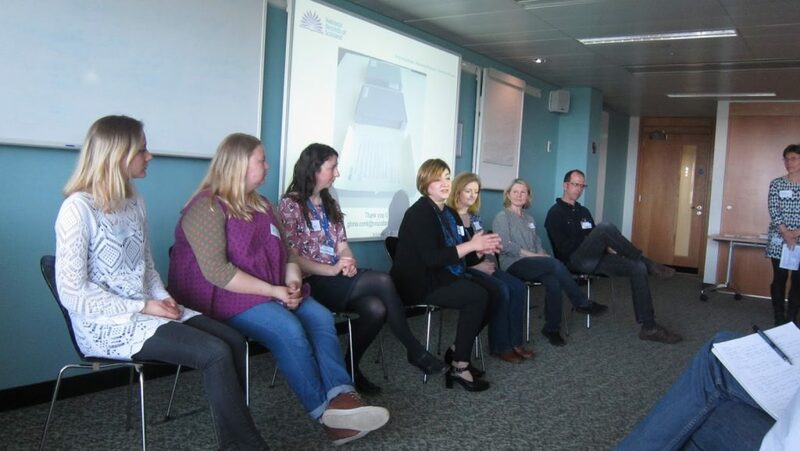 Scotland’s Paper Conservators gathered on May 4th 2016 for informal 5-minute presentations and socialising, hosted by the Centre for Research Collections (CRC), University of Edinburgh. Organiser Helen Creasy (The Scottish Conservation Studio) began by enumerating the outcomes of last year’s news and ideas exchange; this year’s well attended event will also assuredly be impactful. Talks were enthusiastically received, prompting many questions and fruitful discussions. In this week’s blog, Special Collections Conservator, Emily, discusses how she is using different imaging techniques to reveal concealed script. I was recently challenged with a seemingly impossible task in the conservation studio; to reveal hidden texts in a book without using any invasive conservation treatment. The item in question is Recueil de Desseins Ridicules (1695), a bound volume with 111 illustrations by French artist George Focus. The illustrations have been pasted down overall on to the pages of the volume, however, there is writing on the verso of the drawings which is now, of course, obscured. Little is known about the artist, and this text is thought to be unique, so being able to read it could reveal a great deal about this enigmatic figure.